Henri Maes opened Brouwerij De Halve Maan in 1856 on the promise from his uncle of a contract to supply Sint-Janshospitaal in Brugge with beer. 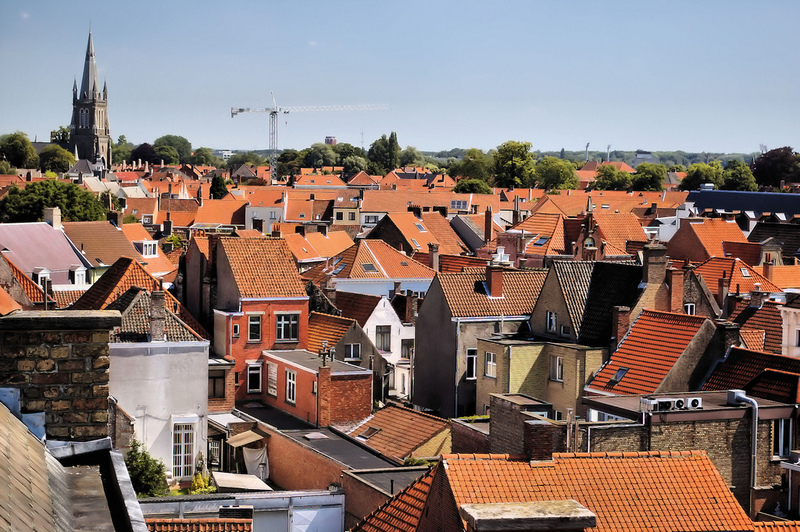 High above the houses, on the edge of the small city, the rooftop of the brewery offers what may be the best view of the contortion of canals, cobbles, gables, and red-shingled roofs. Some of the shingles are new, but each house wears the same uniform cap. Brugge from the top of Brouwerij De Halve Maan. This isn’t my photo, as I unfortunately left my camera in a luggage locker during this leg of my trip. My guide may have been relieved to hear me ask a question other than what’s the capacity? when did they last change yeast? do they use finings? “Are there laws about those shingles?” There’s laws about it all. My tour guide has to apply to city hall for approval of her Christmas decorations. No intrepid entrepreneur offers kayaks and paddle boats for exploring the canals because all canal traffic is forbidden (except for tour boats whose constant narration floats in off the water). A thoroughly modern proposal of paving the streets gained enough traction for construction to begin, only to be overthrown shortly thereafter. The asphalt was ripped up and cobblestones replaced. Though many tourists are charmed by the architecture and history, there is some backlash against the city for its curated and controlled character. While young couples share long kisses on every bridge and old couples totter by holding hands, self-proclaimed savvy travelers say Brugge has no soul and that you’d be better off in Gent. Le Trappiste (Photo taken from their website.) That is not Andrea. Contrary to claims that no one actually lives in Brugge, my first night in town I made friends with a bartender named Andrea at Le Trappiste. He happily trotted out bottles of Brooklyn Brewery Black Ops and the newest Trappist beer from St. Joseph’s Abbey in Spencer, Massachusetts (both being especially elusive in Belgium, these were for show, not tasting), and offered me a bit of his Belle-Fleur IPA from De Dochter van de Korenaar. As friends of his arrived from late shifts at restaurants and other cafés, he brought out pickles and an imperial stout from Italy (unfortunately I cannot find which one, and seem only to remember “10 anno e” being written on the label, which has not helped), generously shared among us. I had lots of fun joking around and sharing the after-work relaxed atmosphere after the official closing time of the bar and well after the rest of the town had become sleepy and shut up. 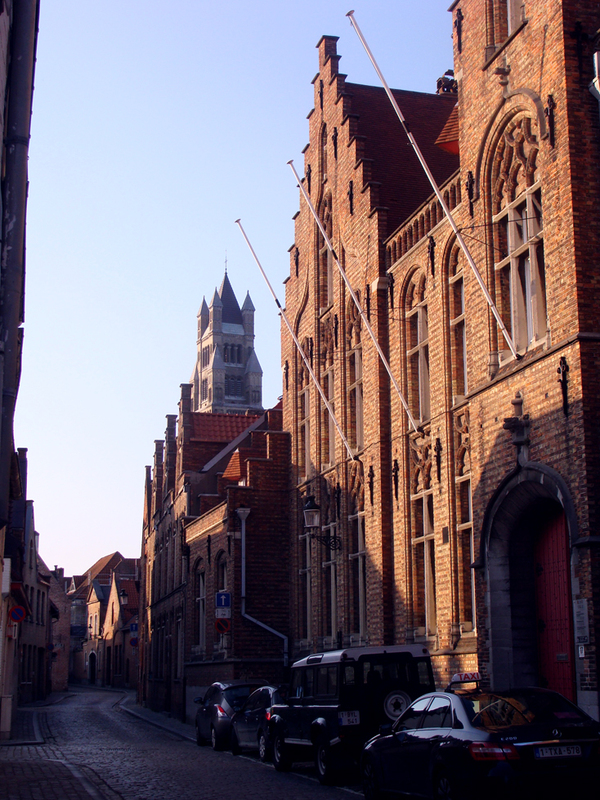 The only picture I took in Brugge before I accidentally locked away my camera with my luggage in a neighboring city. However, I admit to finding the rest of my time there relatively dull. Other than my fraternal visit to Le Trappiste, the interesting historical tales told at Halve Maan, and the incredibly cozy and warm (though for me not so sociable) brown café ‘t Brugs Beertje, not much of Brugge captured my interest. While it is beautiful, it is also very uniform. It does not carry the intensity of a place like New York City or the easy openness of somewhere like Fort Collins, Colorado. For all its romance, the city seemed sterile. There were no narratives or human interest to be found in the exhibits and historical sites I visited. 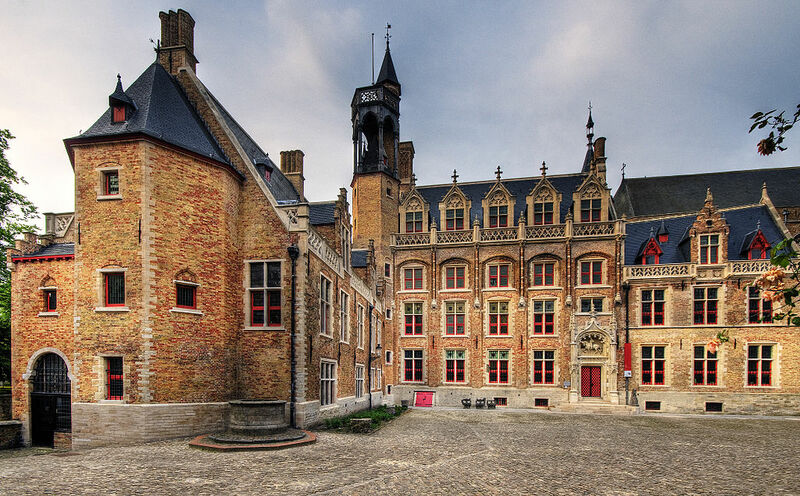 One of the last places in Brugge I was really interested in visiting was the Gruuthuse. It was once the enormous mansion of a family who owned the rights to collect tax on gruit, the concoction of herbs and spices used to flavor and preserve beer before the use of hops was common (or legal). So great was their fortune that they extended the house to include a chapel connected to the church next door, so that family members could conduct their worship in private and privilege. However, the space inside the house was totally dedicated to an exhibit of craftsmanship throughout the last five centuries, arranged by material and presenting only technical information and artifacts isolated from the context of the lives that surrounded them. There was no story in the slightest of either these items (for the most part seemingly unconnected to the house or family) or the family that once lived in the space. In light of this, I felt fortunate that my time in Brugge was short. Some day it might be nice to visit again with some company, but while I was alone all the city could do was put me in conversation with myself, rather than engage me in some kind of dialogue of performance or narrative. The next few days promised activity and interest that couldn’t disappoint – cycling roughly one hundred miles through Flemish farmland and coastline. 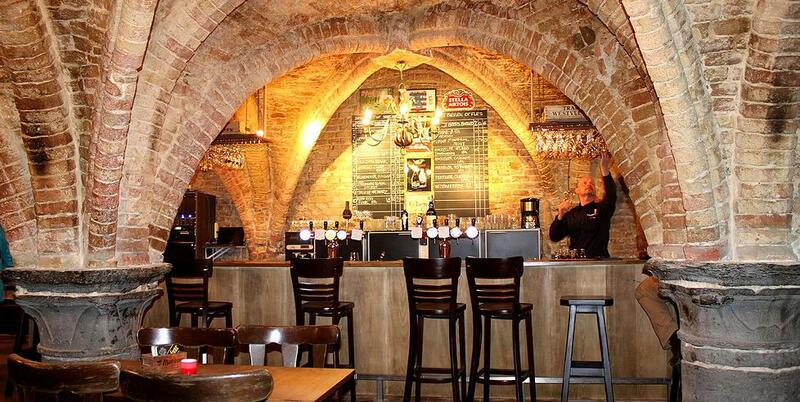 This entry was posted in beer, travel and tagged Belgian, Belgium, Brouwerij De Halve Maan, Bruges, Brugge, gruit, Le Trappiste on June 10, 2014 by Dylan Bargteil.